Have you traveled to the country or even a far away land recently? When a book is based in a place I’ve been, I gobble it up. Ireland still calls to me even though its been two years since we visited. 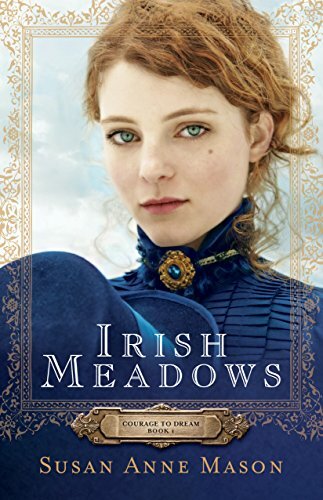 Don’t you love the blue of her eyes on this cover for Susan Anne Mason’s historical novel called Irish Meadows? Oh, take me back to Ireland if only in the pages of a book! A Semi-Sweet Summer by Jan Elder is sure to delight the senses with this witty cover. It’s country setting is nice. And I’m always in the mood for chocolate. If he doesn’t want that chocolate I’ll take it! Like the chocolate in Jan Elder’s cover or the solemn stare of our dear Irish girl in Susan Anne Mason’s? Tell me what you think in the comments below. Thank you so much for featuring “Irish Meadows'” cover ! I hate to admit that I wasn’t thrilled with the cover at first, but once I got my pre-conceived ideas out of the way, I fell in love with Brianna’s eyes! Hope you like the story if you ever get a chance to read it! We have such high hopes for our cover art before we see it for the first time, don’t we? To me, the cover sells the book as much as the back matter does. They are both nice, but I love the Irish Meadows cover. The colors are pretty eye-drawing, aren’t they? Thanks, Erin, for featuring A Semi-Sweet Summer. It’s part of a Pelican Book Group line called “Pure Amore”. All of the titles are New Adult and have a similar look. I asked for chocolate and a bucolic country scene since my hero is a dairy farmer and the publisher delivered! It’s so nice when they take our suggestions for cover art into account, isn’t it?